Dr. Hammad is a board-certified ophthalmologist who specializes in the medical, surgical, and laser treatment of the retina and vitreous. He is fellowship trained in vitreo-retinal surgery. Dr. Hammad is a graduate of the University of Jordan Medical School. He completed his ophthalmology Residency at Albany Medical Center and furthered his specialty with a neuro-ophthalmology fellowship at Michigan State University and a vitreo-retinal fellowship at Texas Health Science Center at San Antonio. He is board-certified in ophthalmology by the American Board of Ophthalmology, as well as the Jordanian Board of Ophthalmology. In addition, Dr. Hammad completed his Masters of Business Management at the Yale School of Management. He is a member of the American Academy of Ophthalmology and the American Society of Retinal Specialists. 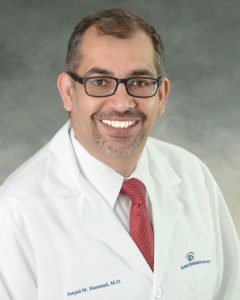 Dr. Hammad is president-elect of the New York State Ophthalmological Society. He has worked and lectured frequently in the Middle-East, as well as the United States. He has organized and taught in many conferences and workshops in Jordan and Dubai.